Add-on sales with Sun's Up! are Eazy! Start with Sun's Up! Placemat pattern…EAZY PEAZY’s latest. 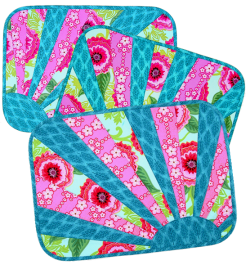 Add-on the Bosal Placemat Craft Pack containing 4 pre-cut 13" x 18" placemat forms made with Craf-Tex plus (fusible on both sides) recommended in the Suns Up! pattern. AND there’s another add-on sale with the Phillips Fiber Art 10 Degree Wedge Ruler for creating the sunray segments. Visit our booth at Fall Market Houston and see Suns Up! plus all the other new patterns.